3) B cell degrades antigen into peptide fragments, then presents them in the groove of MHC class II molecules that reside on the B-cell surface. 4) If the T-cell receptor of an effector T-helper cell binds to one of the fragments, then cytokines are delivered to the B cell, initiating the process of clonal expansion. Figure 16.9 Antigen Presentation by a B Cell This process enlists the assistance of an effectorT-helper cell, which can activate the B cell, allowing it to undergo clonal expansion.The T-helper cell also directs affinity maturation, class switching, and the formation of memory cells. that respond to the antigen. As some of the activated B cells continue dividing, others differentiate to form plasma cells, which begin producing IgM. The net result is the slow but steady increase in the titer, or concentration, of antibodies. ■ Affinity maturation. This is a form of natural selection that occurs among proliferating B cells, effectively fine-tuning the quality of the response with respect to antibody specificity (figure 16.12). An inordinately large number of mutations naturally occur in certain regions of the antibody genes as the activated B cells replicate their DNA in preparation for division. Some of the mutations result in alterations in the antigen-binding site of the antibody (and therefore the B-cell receptor). B cells that bind antigen most tightly and for the longest duration are most likely to proliferate; others undergo apoptosis. 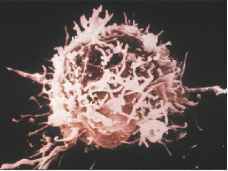 Figure 16.10 Lymphocytes and Plasma Cells (a) Light micrograph of a T lymphocyte.The morphology is the same as that of a B lymphocyte. 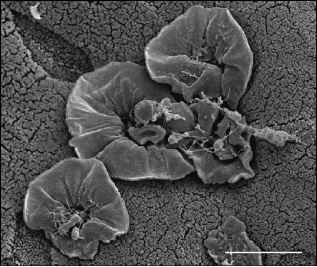 (b) Scanning electron micrograph of a T lymphocyte.T and B lymphocytes cannot be distinguished by microscopy. 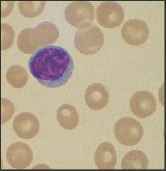 (c) Plasma cell, a form of B cell that is highly differentiated to produce large amounts of antibody. 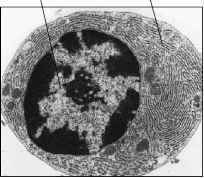 Note the extensive rough endoplasmic reticulum, the site of protein synthesis. All of the antibodies produced by a single plasma cell have the same specificity. 10 mm most commonly switch to IgA production, ultimately providing mucosal immunity. ■ Formation of memory cells. Some of the B cells that have undergone class switching form memory cells. Memory B cells persist in the body for years and are present in numbers sufficient to give a prompt and effective secondary response when the same antigen is encountered again at a later time. 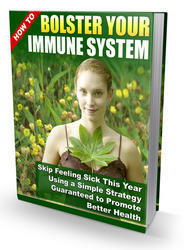 The antibody response begins to wane as the antibodies that accumulate clear the antigen. Progressively fewer molecules of antigen remain to stimulate the lymphocytes, and, as a result, the activated lymphocytes undergo apoptosis. Memory B cells, however, are long-lived even in the absence of antigen. In addition, specialized dendritic cells called follicular dendritic cells appear to retain antigen in small amounts, using it to continually rejuvenate the memory response. The process is not well understood.